Drive gearfor BMG DUALDRIVE 1.75mm, inner diameter 8mm - set of knurls for BMG extruder - high-quality replacement from our proven supplier Trianglelab. The shafts were made using the precise CNC method. The cogwheels are treated with hardened steel during production and then nickel-treated. 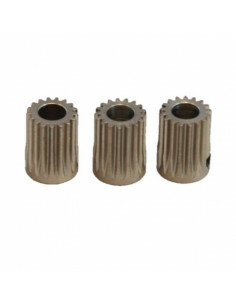 The whole process significantly improved the durability and reliability of the knurl gears. Extruder thanks to this very well controls the filament during work.